On Tuesday, June 2nd, hundreds of professional NYC women gathered at Edelman’s TriBeCa penthouse for ColorComm’s inaugural “She Who Dares” Cocktails and Conversation event. Featuring guest speakers Kelli M. Coleman, who is executive vice president at GlobalHue and founder of She Who Dares, and Tai Beauchamp, a TV personality and host of TLC’s upcoming show Dare to Wear, the event empowered the audience of female movers and shakers to dedicate their time and energy to not only working on outer success but inner fulfillment as well. “Tonight we’re going to push through vulnerability to be courageous,” said professional development coach and human capital consultant Jovian Zayne, who served as moderator for the discussion. Both Beauchamp and Coleman shared their personal journeys towards finding their true passion and purpose, and made it clear that the definition of success goes beyond professional achievements. “The greatest project you will ever work on is you. You cannot be great if you do not know your true purpose,” said Coleman, who was recognized on Black Enterprise’s “40 Next” list for being amongst the top millennials changing the world of business. Beauchamp added to Coleman’s point and highlighted the importance of focusing on your personal well-being in order to reach fulfillment. “I learned that I had to invest in my personal life just as much as my professional,” she said. Before opening the event for Q&A, the ladies offered the following three tips to help attendees attain both personal and professional happiness. 1. Manage your mind. Don’t be consumed by negative thoughts. 1. Spend a daily 10 minutes alone with yourself. 3. If a relationship is not reciprocal, it is not a relationship. 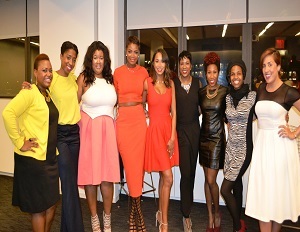 To learn more about ColorComm and their upcoming C2 2015 Conference next month visit colorcommconference.com.